There is no vision of hell more perfect than that of the surface of Venus. With it’s cracked, rubble strewn orange surface, yellow sky, and blistering average surface temperatures ranging in the high 800’s (Fahrenheit), Venus has a myriad of ways to kill you. Whether it’s its extreme surface pressure, which measures at 92 Bar (the average surface pressure on the surface of our planet is 1 Bar, for example), temperature, or volatile storms or equally, if not more, volatile chemicals in the air, and–oh–80% of the planet is also covered in lava plains. Scratch my earlier statement. Venus isn’t just a perfect vision of hell, it is hell. Needless to say, humanity would have a difficult time engineering a way to survive on the Venusian surface. 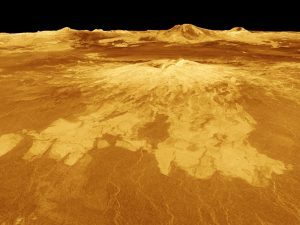 And even if we did have the technology to make it happen, everyday life on Venus would be extremely dangerous. People often ask why we haven’t sent humans to Mars, and the truth is that it’s a matter of managing risk to potential Martian settler’s lives. That’s why the plans keep getting pushed back, cause the tech just isn’t there yet. There is, however a different option for settling on Venus. Since Venus’ gravity is 91% equal to Earth’s, it would be easier on our bones. But, instead of trying to establish a base on the blistering, lava covered surface of the planet, we could instead settle in the upper atmosphere, where the pressure and heat levels even out. There would still be challenges, believe me, but it’s probably more realistic than trying to send humans to hell. 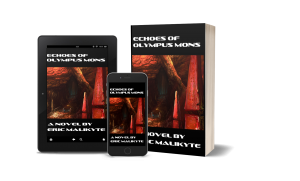 Echoes of Olympus Mons is coming out in just 9 days! You can get the Kindle edition for 25% off by pre-ordering now! issue. I’ve tгied it in two diffеrent web browsers аnd both show thе same outcome. I’m not sure, they seem to be loading fine when I test it on my own connection.